Take your next vacation in Acadia National Park. It is located just outside of Bar Harbor Maine right on the rocky coast. If you want to see authentic Maine, don't miss Acadia. Acadia encompasses over 47,000 acres of granite-domed mountains, woodlands, lakes and ponds, and ocean shoreline. Such diverse habitats create striking scenery and make the park a haven for wildlife and plants. 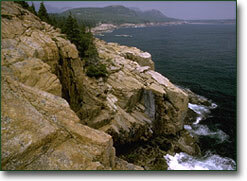 Acadia National Park was originally established in 1919 and named Layafette National Park. It was the first National Park east of the Mississippi. The park was renamed to Acadia back in 1929. During certain times of the year Acadia's most famous peak, Cadillac Mountain at an altitude if 1,530', is the first point of land on the eastern seaboard to see sunlight. Cadillac Mountain is also the highest point along the North Atlantic coast. Acadia National Park is truly a treasure for all to enjoy. Today the park offers scientific, educational, and recreational activities unparalleled along the east coast. Of course, you can hike to the top of Cadillac Mountain to enjoy a spectacular sunrise over Frenchman’s Bay or explore some of the quieter, more secluded mountain paths. You can also bike over 40 miles of the tree-lined carriage roads that wind over hillsides and near glassy lakes. Join a ranger to experience Acadia’s resources first-hand. Or just admire the views and let yourself unwind, knowing you're taking part in a long-standing tradition. Located on the rugged and rocky coast of Maine. The park features over 47,000 acres of granite peaked mountains, lakes and smaller ponds, woodlands, and of course the famous rocky ocean shore.